So I installed a ceiling fan intending to cover up the wire holes with trim. As you can see below the holes drilled were too big. The entire house uses this size and type of trim. It would look weird putting larger trim here. 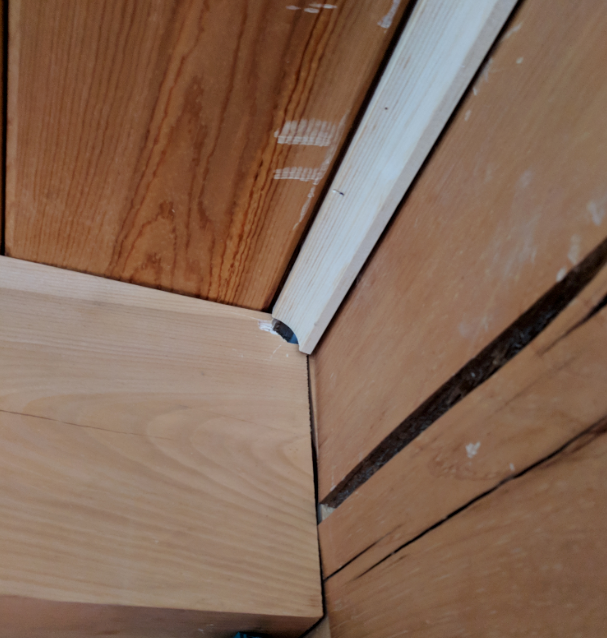 Would filling the hole with wood filler be a viable solution? Would the wood filler interact poorly with the fan wiring? This isn't common on an open wall, more for shadow boxes and such. 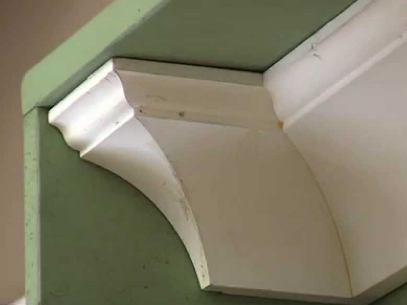 However, you could remove that piece of molding and cut another piece with a 45° angle where it meets the corner. Then cut a small piece about 1ft. long with 45° angles on both ends. Then cut yourself a dead end on the left side. You will probably have to cope the excess wood at the corners for the wire to fit better. You can pinch nail both pieces at the top and bottom for a tight fit in that area. Not the answer you're looking for? Browse other questions tagged trim wood-filler or ask your own question. Is it safe/energy efficient to surround hydronic baseboard heaters with a wooden enclosure? What's the best way to seal an access hole in a wooden gate? Framing around depressed area of floor: a good plan? Uneven ceiling, best way to fix it? Best way to reattach this molding to the drywall?